As Bitcoin prices surge in the global markets, the speculation of it being a bubble has also popped up! But we are not sure if it really is a bubble but this tweet very well shows what it is. Bitcoin isn't a bubble, it's the pin. Keeping the sarcasm aside for a moment, people all around the world have started asking themselves questions. These are some hard questions that naturally arise but are often go unanswered or at best are vaguely answered. That is why, in this article, I will try to explain the last question – What determines the value of Bitcoin – which will ultimately also answer the other two questions. According to me, there are 6 factors that determine the value of a Bitcoin unit. I know that measuring value in fiat is quite not right but forgive me for doing that because there is no other way as of now. Fungible – One unit is equivalent to another. Divisible – Can be divided into smaller units of value. Uniform – All versions of the same denomination have the same value. Portable – Can be carried along and exchanged. Durable – Can be used a number of times without degrading. And if you open your eyes and see, fiat currencies around the world don’t serve these criteria well but Bitcoin and Gold do it in an accurate way. I would say Bitcoin does it better than Gold that is why it is valuable. If you see, like any other commodity or forex markets, Bitcoin also has its market where it is bought and sold. So the demand & supply or surplus & deficit in the market also determines the value of Bitcoin. In a more complex way, humans don’t have any method as of now to measure the value of Bitcoin. So often on exchanges, it is measured based on last few trades and their moving averages. Also to calculate its moving average and last traded price there is no standard way, that’s why you see different prices on different exchanges. I understand if some of you say it is not right, but I will tell you in section 6 that it happens mainly because of the Thiers law in effect. Also, Bitcoin has a huge network effect, which in simple terms means the platform or the network itself becomes more valuable as more and more users join and use it. Take, for example, a fax machine. Now assume there is only one fax machine in the world. Do you think it is valuable? Now think if there is one fax machine in each country. Countries can receive a fax. Now think everyone has a fax machine! Everyone can receive a fax! Another example – Does Facebook with no friends make sense? Do email IDs with no email ID users make sense? Absolutely not! So when something is useful already, the more people join it, the more useful and valuable it becomes in both theory and practice. Bitcoin is by far the most distributed and decentralized project until this moment in the history of humanity. It has more than 20,000 computers or nodes securing the network where they maintain an independent copy of the Bitcoin’s blockchain or ledger so that no one can double spend. Also, Bitcoin doesn’t have any single point of failures because there are no central servers. You can see it like a BitTorrent which is only peer-to-peer which is why it is not possible to stop it. This features also gives Bitcoin a tag of ‘censorship-resistant money‘ unlike the fiat money of all the countries that can be manipulated at any time. This gives a unique value to Bitcoin. Metcalfe’s law, you can say, is another name of network effect that I talked about in section 3 above. It is a law presented by Robert Metcalfe which says that “the value of the network is proportional to the square of the number connected users of the system” i.e n^2″. You can hear more about this in the below video. 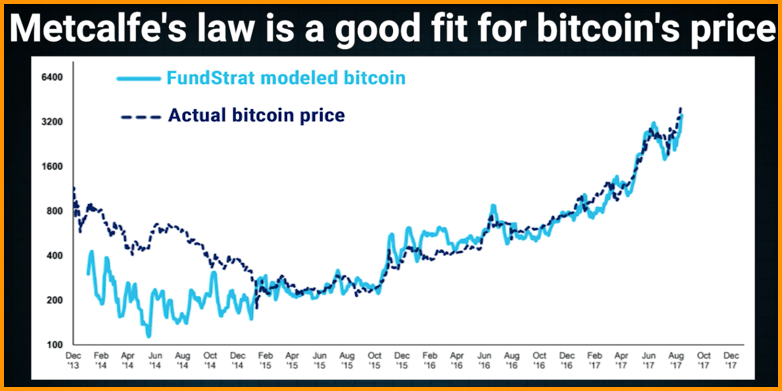 Also, many including Max Kieser, a very early adopter of Bitcoin says that the value of Bitcoin is also determined by Theirs law which says the bad money would drive good money to a premium rather than driving it out of circulation. And that is why, in many countries, Bitcoin is priced much higher on premiums because of this law and is superior to that country’s ‘bad’ money. Bitcoin’s value might have been in cents in the early days but as more and more people look into the Bitcoin protocol every day, they come up with new possibilities and inventions. In case you are unaware, Bitcoin does offer some basic smart contract abilities which traditional money can never have without trusted third parties justifying one more reason for the high Bitcoin value which is only increasing at a rapid pace. It would not be right to give BTC a price tag in USD or EUR because there is no standard way of measuring it. RSK, a smart contract enabling project on Bitcoin. Lightning Networks for lowering fees and making transactions. It is as clear as the day when Satoshi Nakamoto invented Bitcoin to make it possible for many of us to exit from the existing traditional banking system. And this was the loftiness of the invention and hence there is no specific way to measure or find out what determines the value of Bitcoin. That is all I have to say about the value of Bitcoin in this article. I will be back with another article soon! Until then, stay connected and keep sharing and learning about the Bitcoin revolution with CoinSutra. What do you think about Bitcoin’s price and value? 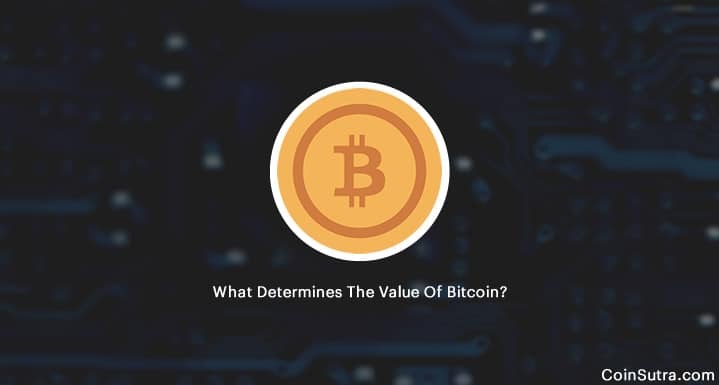 Do you know about any more parameters that determine the value of Bitcoin? Feel free to post your questions and comments below! It is always good to share the knowledge. If you find this post informative, share it with your friends on Twitter and Facebook! How Is Ethereum Blockchain Different From Bitcoin’s Blockchain? Thanks for such detailed n educational articles about Bitcoin valuations, etc.